North bound and headed to Wayanad, we interlude our Kerala sojourn at quaint little Kozhikode, Calicut. We put the city on our map for its non- touristy, small town charm. As our train chugged in after a short ride from Cochin, we hopped into a good old Ambassador – it was the first of many things ‘old world’, about to unfurl. This trip we were taking was planned on another trip, on another continent at the fag-end of a fabulous year at B-school for M. When I was piecing our week together with and for our dear friends Satoko and Bernhard (their first visit to India at that), my virtual search led me to a gorgeous homestead in Calicut. In fact, this precious gem was the reason for the interlude. As heritage restoration and preservation enthusiasts and lovers of Ayurveda and Yoga, our interest peaked even more as Harivihar married these elements beautifully. 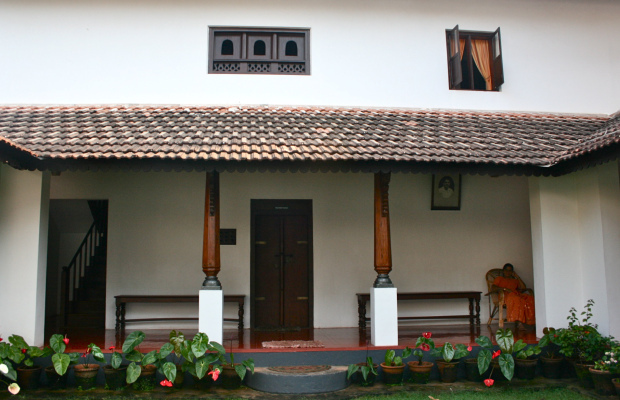 This heritage homestead is a royal manor-house built in Kerala-style architecture, more than 150 years ago. It was inhabited until the 1980s after which the abode went the route of heritage homes getting neglected. The inheritors of this abode – Dr. Srikumar and Dr. Neetha - have tastefully restored this heritage home and given it a new lease of life, restored it to its formal glory, may be even more. Thankfully, it didn’t get replaced by an apartment complex – the usual route that bungalows and heritage homes have gone in the last few decades in India.Our host, Dr. Srikumar took us on a tour, showed us pictures of restoration work and answered my questions about the gorgeous antique wares that dotted around Harivihar which is simplistically, yet impeccably adorned. The next morning we got ourselves an Ayurvedic massage, plonked on grass, sat around the bathing pond, chatted and drove to a the ship building yard at Beypore before heading up the curves to Wayanad. Harivihar lived up to its promise of ‘pristine living’. 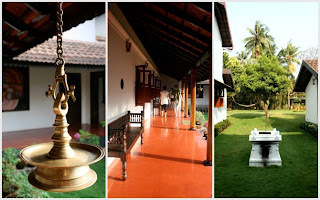 It immersed us in authentic Kerala culture – from the relaxing environs of its nalakettu (traditional Kerala home with a quadrangle in the centre), to the home-cooked Malabar delicacies, the pond and the pleasing décor. The short stay at this lovely homestead enriched our travel to Kerala, manifold.